Every trader’s secret wish is to be psychic. If we could only know in advance whether the market was going to go up or down. Well, good luck trying to predict next year’s return - or even just tomorrow’s. But surprisingly, there are several recognized methods for projecting the S&P 500’s return in the next 7 to 15 years, and they’re pretty good. Buffett’s MV/GDP says minus 2.0%. Divide the S&P 500’s market value by the U.S. gross domestic product. Buffett wasn’t the first person to suggest this metric, but he’s said on the record that it’s “probably the best single measure of where valuations stand.” If the index fell 2.0% annualized, your $2,700 would turn into $2,206. Not so great. Tobin’s “q” ratio indicates minus 0.5%. This metric divides the market value of all U.S. equities (not just the ones in the S&P 500) by the cost to replace all of the companies’ assets. It’s based on academic papers by economists James Tobin, a 1981 Nobel laureate, and William Brainard. This formula predicts that your S&P 500 account will drift slightly lower in real terms, not quite keeping up with inflation. Jones’s Composite says minus 4.1%. Jones uses Buffett’s formula but adjusts for demographic changes. For example, as America’s population ages, this reduces economic demand. The resulting Demographically and Market-Adjusted (DAMA) Composite has predicted the S&P 500’s 10-year returns more closely than any of the other formulas since 1964. Let’s hope he’s wrong. A 4.1% annualized loss would drive your $2,700 account down to $1,776 after 10 years. That would be a 34% decline, almost as bad as the “lost decade” of 2000 through 2009. Jones is the first to say that these formulas, including his own, aren’t guarantees and can’t be used to time the market. After all, the S&P 500 could go up for the next five years at a 1% real rate, before dropping 9% a year for the next five years. The initial rally, followed by a fear cycle, would suffice to reduce your account to $1,776. 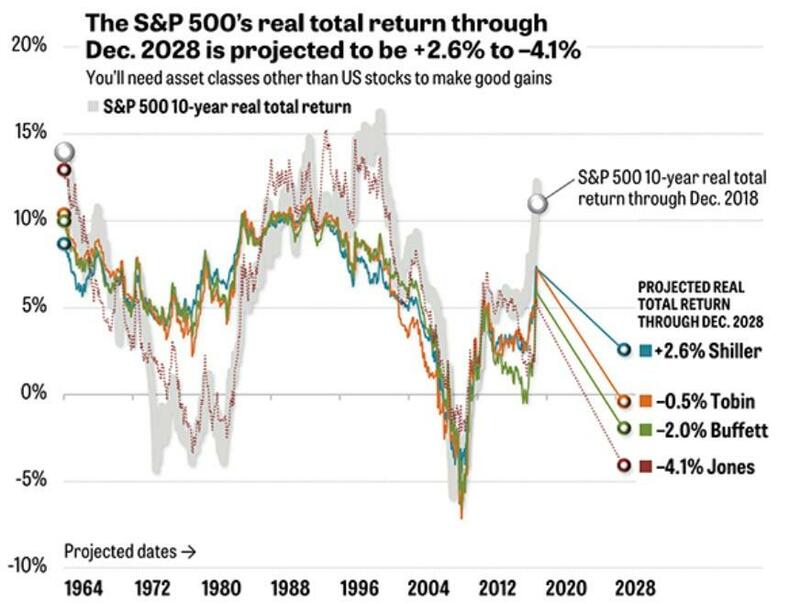 That’s not a prediction - nothing about the market happens in a straight line - but remember that the S&P 500 has crashed much harder than a 34% loss TWICE in the past two decades. He attributes this to the unprecedented stimulation that the Federal Reserve pumped into the economy (and is now removing—watch out below). Markets tend to revert to their average performance over time, which is not nearly as much fun as it sounds. For long-term investors, the likelihood that the market is overpriced and will eventually pull back to a lower valuation should flash a bright yellow “caution” light. 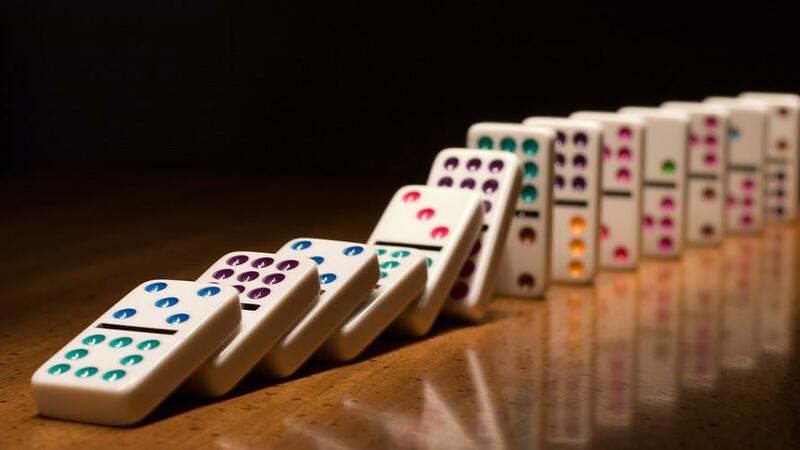 A disappointing decade is not the time to gamble your money on a 100% stock portfolio. Diversifying into other types of assets can prevent any one index - such as the S&P 500 - from dragging down your performance. During the 2007–2009 bear market, the S&P 500 lost 56%, adjusted for dividends and inflation. In the same period, Vanguard’s long-term Treasury fund gained 18%, and iShares’ gold actually rose 22%. No mater how bad the stock market may get, something else is always going up.